Use the Lab Procedure to walk you through the online simulation Ecology Lab that explores the relationship between food web complexity and biodiversity in an ecosystem. 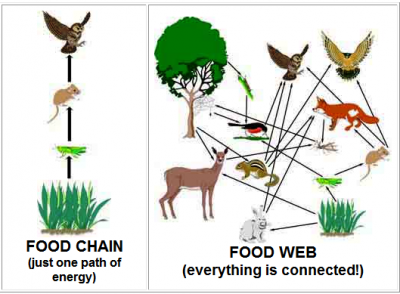 The guiding question of this investigation is, How does food web complexity affect the biodiversity of an ecosystem? This should be completed in groups of 2-3 students. Remember to make your own copy of the google doc and move it to your science folder. After you have completed the exploration, you will now use guided notes to learn more about the complexities of ecosystems through vocabulary development and close reading of the CK-12 notes. These notes should be completed independently. After you have completed the notes, pair up with another student. Together visit at least 1 video and 1 interactive. As you are reviewing be sure to think about what roles you need to fill in your own ecosystem. Include your brainstorming ideas in the close out google form. Ecosystem game: build food webs to wipe out your component and grow your own population! Based on the information you have gathered so far, you are now going to use this document to engage in analysis of an aquatic food chain and read about a real world problem of sea lion pups being abandoned in California. From there you are going to draw conclusions on how energy is transferred in ecosystems and learn a few ways humans are effecting them. This document should be completed independently. In this assignment, you will create your own creatures to be a part of an intricate food web found on a distant alien planet. Your creatures are living peacefully but (oh no!) a natural disaster hits that upsets the balance of your fragile ecosystem. It is up to you to preserve your plant's history. Use this planning document to help guide you along they way!